Some used a coffee can with a wire handle hooked into drilled holes. Some used an old pillow case. 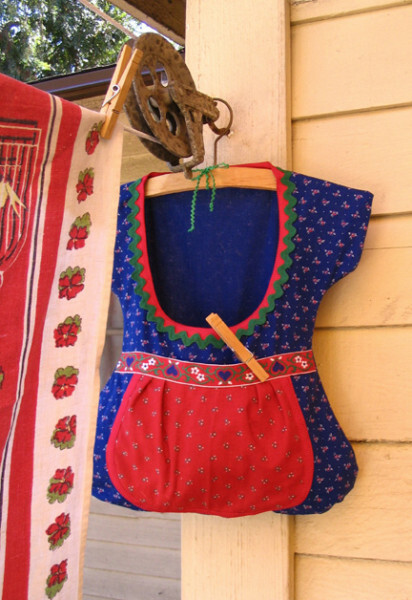 Some wore an apron with pockets. And many used a bag specifically designed for storing clothespins. These vintage bags were often styled after a woman’s blouse and apron or a little girl’s dress, and featured a large pocket for storing hordes of wooden pins for hanging laundry. Over at knick knacks & ric rac, Hannah created her own pattern (she feared her vintage bag was about to fall apart) and posted a downloadable template, along with step-by-step instructions via images. It’s a surprisingly simple pattern, allowing the fabric design to do all the work. Sure, there are much more ornate bags you could buy or make, but Hannah’s pattern makes for a perfect Saturday afternoon project. Of course, to stay in true vintage style, the bag needs to hang from a wooden hanger! Let us know if you decide to sew your own clothespin bag and, most importantly, we want to see pics!